Technology has brought us close together. Satellite communications, TV, Radio, Internet has made the world a smaller place. With the whole world moving towards ip network, the world will become ever more converged. There was a time when individual devices like TV, VCR, Radio, etc had to work independently and beautifully. Nowadays they have more responsibility and must communicate with the other devices for a sublime consumer experience. Gadgets have come which make everyday electrical utilities to form part of ip network. You can control your electrical equipments, heating and cooling devices away from home through your smart phone. In this blog, we are going to talk about bringing the entertainment devices together so they seamlessly communicate with each other and reduce the hassle of managing individual devices. There are 2 locations from where you can get your share of entertainment: In House and Online. In House store of entertainment would refer to the Movies, Music and Pictures present on your Laptop, Desktop, DVDs, Hard Disks, etc. 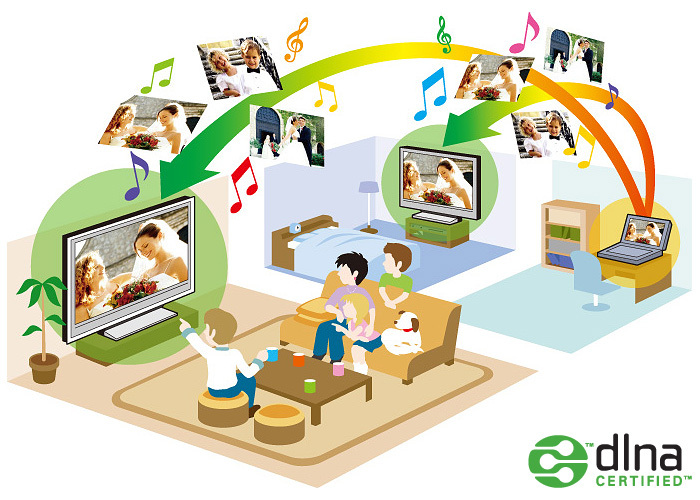 In House entertainment relies on DLNA to stream media from device to device. Online entertainment would refer to the Online Movies, Radio, Live TV, Video on Demand, etc which requires High speed Internet. The best Software for this is XMBC which was originally meant for XBOX. The primary protocol on which almost everything is working today is ip. Internet, telephony, TV, Radio, many home appliances, etc. Are working on ip. Taking advantage of the common factor ip, Sony spearheaded the development of a protocol which will allow all devices in a home to share media with each other. This protocol is called DLNA and stands for Digital Living Network Alliance. The protocol is open standard and all major manufacturers support it. 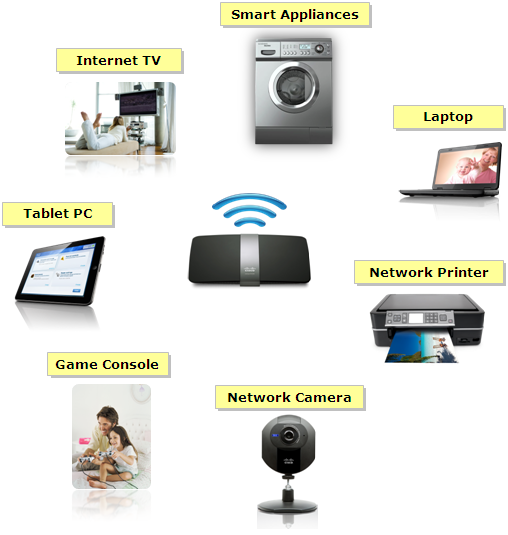 DLNA is supported by TV s, DVD Players, Tablets, Smart Phones, Computers, Routers, Speakers, NAS Hard Disks, etc. What this makes possible is that Music, Video and Pictures on any of these devices can be played on every other device. You can watch movies which are present on your smart phone on your TV. You can stream music from your Laptop to your DLNA enables speakers. You can watch your photo album on Digital frames. DLNA can be enabled on Windows using windows media player 11 or in Mac through XBMC. Other devices have built in support for DLNA. 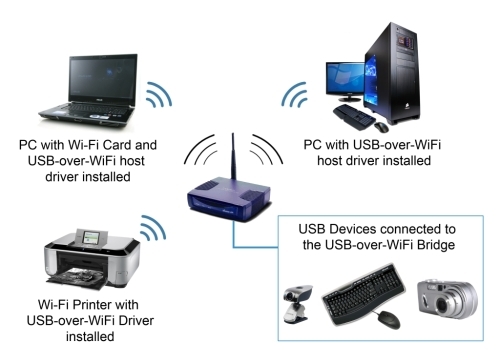 A Wireless Network: This forms the basis of the whole Wireless connection. It is better to have a powerful router so as to support the high data rate and fast speeds. There are routers available which supports dual band which means you can have two separate channels to increase the bandwidth in the WLAN. Smart TV: The TV forms the Primary output for the Digital Home because it can play Movies, Music as well as Pictures. A Smart TV is required is because it can play online content through netflix, hulu, etc. As well as local content through DLNA. The limitation with Smart TV is that it cannot be customised to play free Content from the Internet. To take advantage of the free content from the Internet as well as Free Live TV, it is better to connect a PC or Jail broken Apple TV to your TV set through HDMI. You can install XBMC on your PC or the Apple TV. 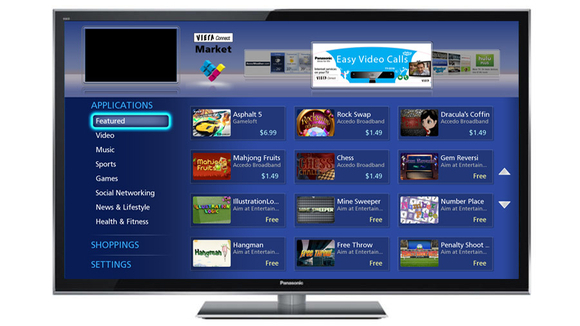 XBMC can bring both local and online free content to your home. NAS Drive: These are regular hard disks that connect to network rather than a PC. This means you can save all your content on this hard disk without any PC to be kept switched ON. This means lower power consumption. The other cool features of a NAS are that these are DLNA capable so that your DLNA capable devices can read directly from it. Many of the NAS drives support bittorrent which means now you do not have to keep your PC switched on to download movies at night because NAS is always on. Few of the NAS have usb port which means you can attach USB hard disks as well as Printers which will make it a network Printer. Apple TV or PC: If you do not have a smart TV but you do have HDMI port on your TV, you can make your TV smart. An Apple TV which is Jail broken is a powerful device which can play 1080p Full HD movies without a hitch. 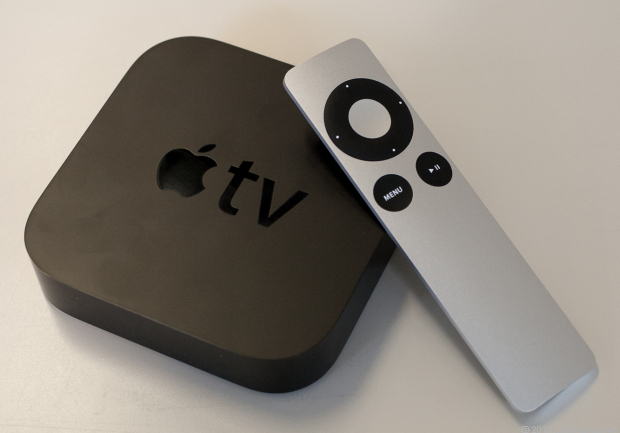 Not only can the functions of an Apple TV be used but also XBMC. So basically you have a device which supports DLNA and Online free content like movies and live TV. If you cannot get your hands on an Apple Tv, you can make a computer which is not in use and small in size, connect to the TV using HDMI out. You must have a graphics card which has HDMI out. You must note that it should be fast enough to support Full HD movies. Smart phone: A smart phone is not necessary but it can be useful for remotely controlling the Media Centre to dance to our command. Softwares are available for both Android and Iphone. 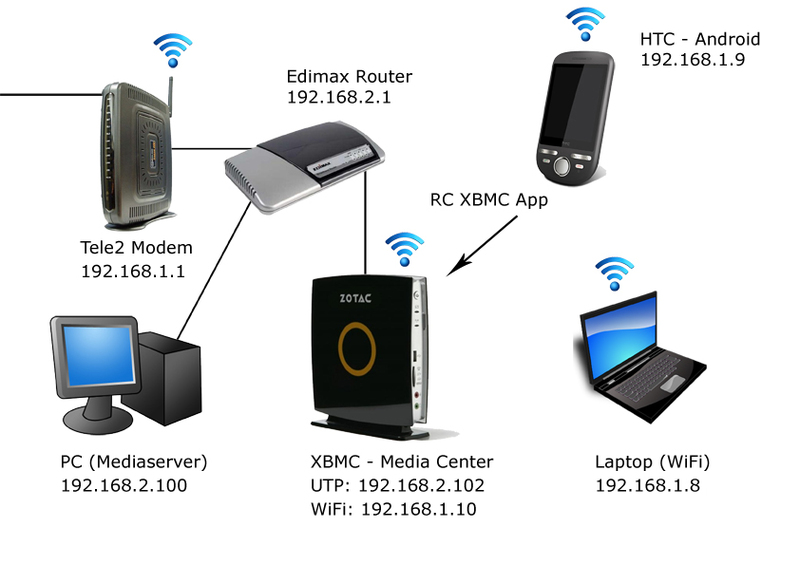 If Smart Phones are not available, XBMC can be even controlled through web browser. 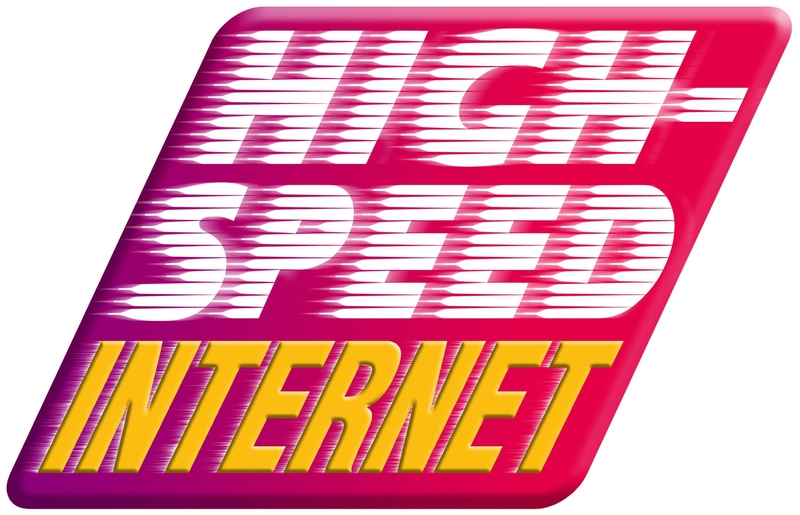 High Speed Internet: This is a very important aspect of a Media Centre in which online content will be played a lot like Live Sports, Movies, Soap operas, VOD, etc. The speed of the Internet should be good so that streaming video can be played smoothly. There should be no cap on bandwidth usage as well as unlimited data transfer. The Most basic things which are the Internet connection and WiFi should be ready. The NAS device should be connected to the network over ethernet and preferably all your media should be kept on it to form a single media warehouse. XBMC should be installed on either Apple TV or a computer and connected to the TV through HDMI. 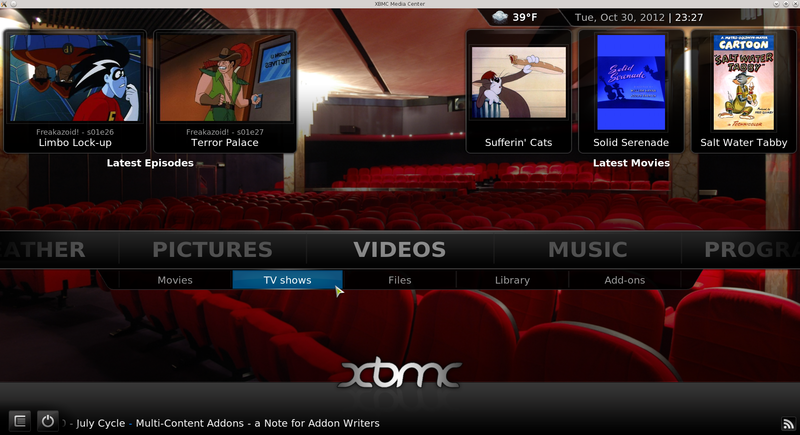 Install the Free Content add ons on the XBMC. If you have Apple TV, the remote comes with it and it is sufficient. 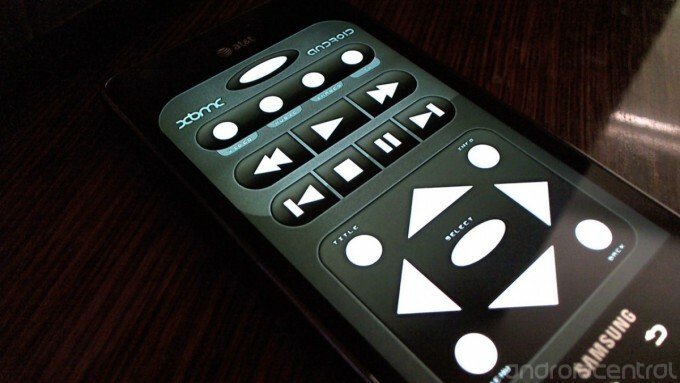 If you have XBMC on computer then you can either install the remote on smart phone or control it through web browser. Now sit back and relax and watch all your digital content on your TV or DLNA enabled device. I hope my post has been helpful in your life but the only guide which can help you in the hereafter is the Qur’an. You can download the English translation of the Qur’an here. This entry was posted in Connected Home and tagged apple tv, dlna, hdtv, nas, wifi, xbmc by samirsogay. Bookmark the permalink.